Let your imagination fly! 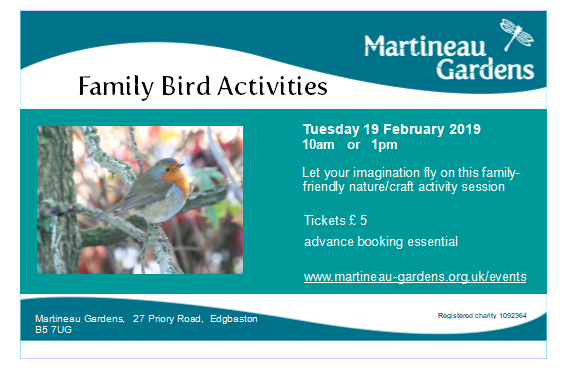 Take part in a 2-hour bird-themed activity session around Martineau Gardens. We will make bird feeders, go on a story walk in the woods, and identify birds visiting the gardens. We’ll then go inside to warm up and finish the session with birdy art and craft. Family learning events are with Juliette Green (Education Officer, Martineau Gardens), our activities are for supervised children aged 3—12 years so parents / carers are expected to stay and join in the fun, but don’t pay. Family learning events with Juliette Green (Education Officer, Martineau Gardens). Activities are for supervised children aged 3—12 years. Parents / carers are expected to stay and join in but don’t pay. Dress for the weather, as parts of the session will take place outside. Bring a drink and a snack or bring your packed lunch if you’d like to have a picnic at Martineau Gardens (after the morning session or before the afternoon session). Martineau Gardens serves hot and cold drinks (for which donations are welcomed) but not food. Bring a used, clean plastic bottle to make your bird feeder. Cost: £5 per child, no sibling discount, parent / carer goes free. Max. 20 children per session. Click on your preferred time below to be redirected to WeGotTickets (there is an additional 50p booking fee on each ticket). Martineau Gardens supporters get an advance booking window. Refund policy: Bookings for courses and events are non-refundable unless Martineau Gardens has to cancel an event or course due to unforeseen circumstances. Become a Friend of Martineau Gardens here.